Getting Here . . .
From Chicago/Milwaukee: Take I-94 north from Milwaukee. Continue on I-43 north toward Green Bay. Exit on highway 310 east to Two Rivers. North on 42 through Sturgeon Bay. 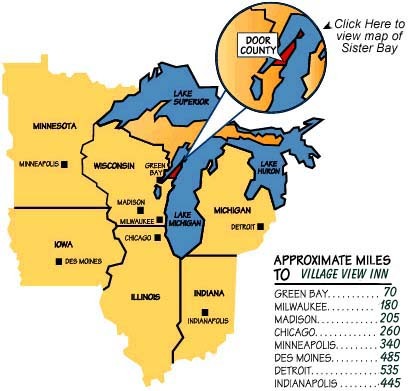 At the north end of Sturgeon Bay you may take either 42 or 57 to Sister Bay. The Village View is located just 150 feet on the right after 42/57 rejoin in Sister Bay. Menomonie, WI). Hwy 29 will take you to Green Bay. Take Hwy 41 north briefly and then I-43 south briefly to Hwy 57 exit going east into Door County (follow Sturgeon Bay signs).